Captain David R “Chip” Herr, Jr. was born on April 4, 1962, in Oklahoma City. After attending Tanglewood Elementary School, Chip entered FWCD as a fourth-grader. 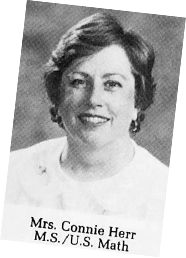 Connie Herr, Chip's mother, taught math in the Middle School from 1984-1992. His sister, Sarah (Sally) Hollenbeck also attended FWCD. While at FWCD, Chip was an excellent student and earned 11 varsity letters in cross country, soccer and baseball. In a Star-Telegram article, his mother said, “Chip was never the best player on the team, in some cases, far from it. I think the example is that whatever talents you have, you should use them to the best of your ability, regardless of how they stack up with anyone else’s gifts.” A highlight of his baseball career at FWCD was pitching under Coach Bob Minnerly at Ranger Stadium. At FWCD, Chip enjoyed the reputation as an exceedingly bright and clever student, a great friend and a conscientious classmate. "Chip was very self-contained. He was a person who didn't go with the crowd if he didn't think it was right. He had his own set of values, and they were very strong. In his world, there was a right and wrong way of doing things, and the right was the way to do it." After graduating from FWCD in 1980, Chip attended Washington and Lee University in Lexington, Virginia. He graduated in 1984 with a degree in geology and was commissioned as a second lieutenant of Marines with order to Basic School at Quantico, Virginia. Classmate and FWCD alumnus, Parker Schenecker ’80 was commissioned into the Army that same day. After Basic Officer Course at Quantico, Chip was ordered to flight school at Naval Air Station Pensacola, Florida, where he earned designation as a naval aviator and pilot of UH-1 helicopters. Chip's first tour of duty was with the Marine Light Air Attack Squadron 369, Marine Aircraft Group (MAG) 39, of the Third Marine Aircraft Wing stationed at Camp Pendleton, California. It was from MAG 39 that Chip’s squadron was ordered to Saudi Arabia in the Persian Gulf in August 1990, the first Marine squadron ordered into theater after Iraq’s invasion of Kuwait. Chip’s helicopter malfunctioned and crashed in eastern Saudi Arabia near the Iraq border on February 3, 1991, during a noncombat mission. He was buried with full military honors at Greenwood Cemetery in Fort Worth. Parker Schenecker '80 honors his long time friend, Chip.